An especially savage full tang fighting knife with large bowie blade geometry. The blade's spine is equally capable and features a serrated cutting edge. 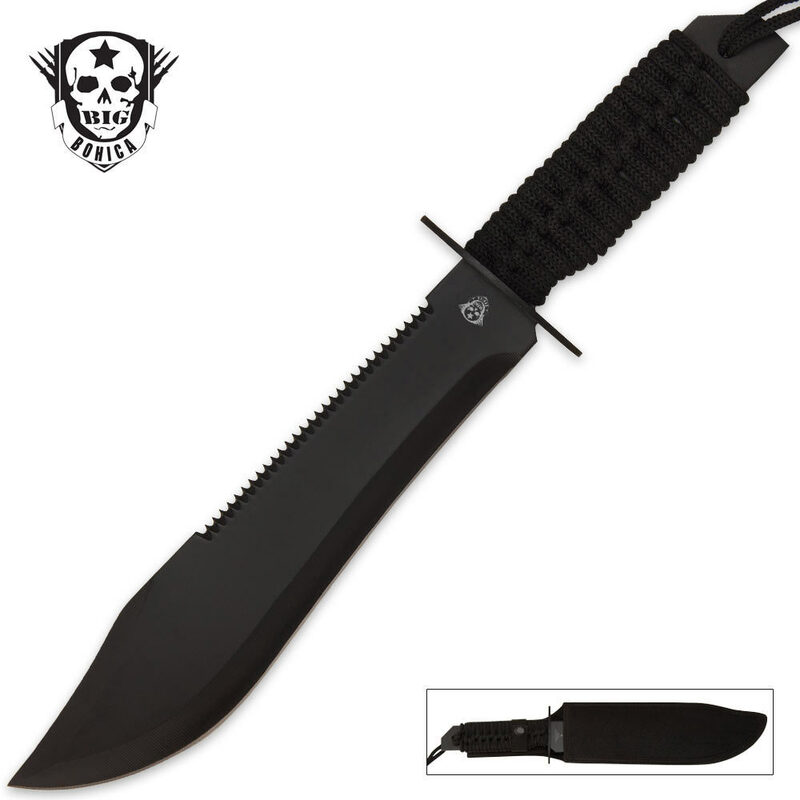 The black-coated blade is crafted from AUS-6 stainless steel and stretches 9 7/8 in. The handle is wrapped in black paracord and a nylon sheath with belt loop is included. 15 in. overall. Ok it is a cheap knife. We get that. Work this knife and the cord pops off. You re-tie and find no matter how tight, it will slide off during work. Left with thin steel handle. I retied and used camo gun tape to secure the cord in place. Worked the knife cutting , stabbing and throwing. The cord stayed on. Good news; the blade is good despite being thin. Is what it is. Light to carry for an expendable backup knife. Just be prepared to secure the cord back on the handle when used. OR put your own handle on. I purchased this knife because it looked good on the site. When I opened it I wasn't very happy. You could tell it was a shabby knife but you could use it for cutting brush. I don't think I would want to use it as a primary survival knife or anything. But it was cheap enough to justify the expense. The Texas Outlaw Bowie bk1955 is one that is well worth it though. I'll even buy another. Over all I have been happy with my purchases in the past. But you have to know you won't like everything that you see. But all in all, I would buy from BudK again and again. Thanks guys keep up the good work. I just got this and holy crap this thing is huge it is like a little machete. The blade doesn't come to sharp, but can be easily sharpened. This is a great buy for a great price. Well you get what you pay for with this knife, It's a good knife for the price but the fact that there is just a tact weld of either side of the blade make think twice and how I would use it. Came with a nice edge right out of the box I was able to slice through palm tree branches. I would recommend re wrapping the handle after a bit of use the cord became very lose. I just had to do another review on this knife, it is absolutely wonderful!!!! First of all I can't believe how they only charge 8 bucks for it!!! Then I sharpened it on my friends Lansky 2-rod Turn Box Crock Stick Sharpener and it took an amazing edge!!!!!!!! It could shave the hair off of my arms!!!! Then, just today I took some of the tape off my handle (that I used to replace the original paracord that slipped off) and put some new 550 paracord that I bought at a surplus store today and it is amazingly comfortable and good-looking!!!! I am buying the Big Bohica Kukuri Machete to match my knife. Thank You BUDK and I ask only one thing... PLEASE MAKE MORE BIG BOHICA PRODUCTS!!!! THEY ARE AMAZING!!!!! Great Knife! Came with a nice edge, but some of the paracord slipped off of the back, so I just removed the paracord and taped the handle up with a thick layer of masking tape, then topped it off with electrical tape. Fits very comfortable in my hand now. Great buy, and I think everyone reading this review should scroll up and click add to cart!!!! You've bought the right knife! Not only is the handle wrapped in it, there must be nearly 6-8 feet extra hanging off the end if it. Kind of awkward to deal with attached to the blade. Like handling a knife with a big pony tail on the handle...but nice to have nonetheless. Blade is thin and cheaply made, but the construction of it is nice. Nothing loose, nothing rattles. You get what you pay for at 6.98. Actually, with this piece, you get a bit more. Very good buy! This knife is great. Blade is sharp. Fantastic survival knife and the price can't be beat. Don't waste your money. This knife is nice if you want to intimidate someone, but it is flimsy and won't hold an edge. Save the extra $9 and get the Cold Steel Bushman. It's twice the knife this is.